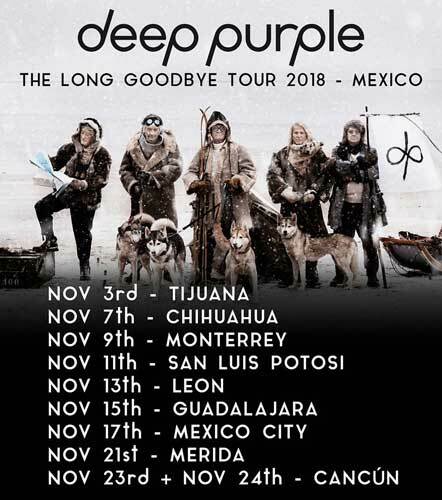 Deep Purple are in the process of finalizing the dates for a tour of Mexico this November. In an unusual twist of events, the dates are already posted on the official site, albeit some venues are still to be determined, and none are on sale. Glenn Hughes has added several more European dates to his Classic Deep Purple Live tour: Prague, Kiev, Moscow, Helsinki, and Tampere confirmed, but so far partially ticketless, while the 3 Dutch dates are on sale, but unconfirmed. Bernie Marsden will be supporting at the Kiev gig. Thanks to Lutz Reinert and Shades of Deep Purple for the info. Is there any word of Hughes bringing Classic Deep Purple Live to Canada ?? I’ve seen pretty much the full show on YT.It is very energetic and faithful to Mark III & IV live performances. tickets for the Glenn Hughes Classic Purple Live show @ Hengelo ( eastern part Netherlands) are on sale. It’s a venue with a capp. of about 800. No seating only standing. Glenn performed there once in 2006 before they moved to a new place, it was a great show and 2 years ago he was sceduled to play with Living Color but that show was pulled out. @1: I interviewed Glenn Hughes last week and he was very proud to say that they are trying to take this show all over the world. As afar as I remember, he didn’t mention Canada in particular but he said North America. Glenn Hughes was a deception in Vila Velha, Brazil. I got deeply disappointed with him. He was hoarse and cold, and made a chaotic karaoke, instead of giving up and put off the show. This seemed to me a disrespect to the fans. I won’t see him again and I can’t since then listen his music on my player. Thanks for the info, Svante . They can all retire happily in Mexico after the tour which is not a bad place!!!! They can all retire happily in Mexico after the tour which is not a bad place at all!!!!! When they said it’s the long goodbye tour they meant every word. After all how long is a piece of string??! !